An Essential Ingredient for Success! Self-confidence is an essential ingredient for healthy development and school success. Confidence is a belief in your ability to master your body, behavior, and the challenges you encounter. Children who are confident are eager to face new challenges and expect adults to be helpful and supportive of their efforts. Self-confidence is crucial for getting along with others and making friends. Self-confident children see that other people like them and expect relationships to be satisfying and fun. Below are ways you can develop your child’s self-confidence: First, really believe that your child can be successful. Most parents have never had contact with a child with hearing loss until their own child is diagnosed as deaf or hard of hearing. Yes, your family and child will need to work harder to make sure that language is truly accessible. 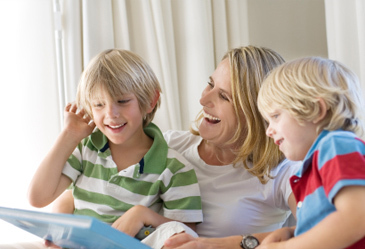 The time you put in to these efforts is an investment in your child’s life long success. See the short video below for the inspiring story of a young boy with hearing loss who, despite adversity, became the famous football player Derek Coleman. Viewing this information with your every year, maybe a few times each year as your child is growing up could be a wonderful boost to self-confidence and determination! Go here for a captioned version of the video. No limits – Olympic athletes thriving with hearing loss Read this inspiring article about athletes who were deaf or hard of hearing who didn’t let their hearing loss stop them from succeeding! Establish routines with your baby or child. When events are predictable your child will feel secure and in control of his world. The predictability of knowing what will happen next and helps him prepare for those changes. If day-to-day events are unpredictable, it may feel too scary to fully explore. When children know what to expect, they feel free to play, grow, and learn. Wearing hearing aids or cochlear implants for ALL waking hours is critical to your child with hearing loss learning that the world is predictable and safe. Allow for and facilitate plenty of opportunity for play. Through play, children learn how to solve problems and develop confidence. It is also through play that children try on new roles and work out complicated feelings. Let your child lead playtime—this will build his confidence, assertiveness, and leadership skills. Help your child learn to be a problem-solver. The goal is to guide and support your child in her problem-solving efforts but not do for her what she has the skills to accomplish herself. Sometimes, your child’s times of greatest frustration are opportunities for her to develop feelings of confidence, competence and mastery. She’ll learn that she can depend on you to encourage her. Meanwhile, she’s the one who finds the solution. Helping her learn to recognize that sound is important and a link to YOU and the experiences in her world is a key foundation to many of the problems she will solve in the future. Practice with your child ways to respond to “What are those things?” Hearing aids are uncommon, especially on children so it isn’t surprising that other children ask what they are. To the unprepared or self-conscious child it may feel like other children are being mean or picking on them rather than just asking for information. Your child’s health self-concept depends on being resilient to questions about hearing technology and confident in ways to answer. A child who has been raised to feel embarrassed of his hearing aids is likely to feel shame and that they have something wrong with them when they are asked about their hearing aids. Ultimately, most of these children stop wearing their hearing aids, even though their school success may be severely impacted. A child can learn many ways to respond to questions – some informative, some funny, some silly and some just matter-of-fact. Those who are raised recognizing that “ear computers” are cool technology and that most people KNOW NOTHING about them can develop a sense of pride in their knowledge. They are the ambassadors who help people who are ignorant of hearing loss and hearing devices learn about them. Self-concept and self-confidence can be improved via the Iron Man poster shown, or books like I’m the Boss of My Hearing Loss. Sapheara is featured along with Iron Man and Blue Ear (a super hero with hearing aids) in a new dual comic book and teacher’s guide entitled “Sound Effects.” In an action packed storyline, together the super heroes work to save New York City while addressing some very important issues such as: bullying, hearing loss awareness, and hearing loss prevention. Produced through the unique partnership between the Children’s Hearing Institute and Marvel Custom Solutions, “Sound Effects” will be distributed to students in the New York City Metro Area from 3rd through 7th grade. 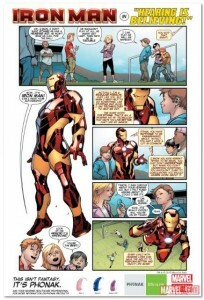 “What’s unique is that Marvel helps translate the impact of this message by using Iron Man along with these new super hero characters who have experienced hearing loss and use hearing aids and cochlear implants to hear.” The Blue Ear, a comic book character who attains super hero powers through incredible hearing and hearing aids has been joined by Sapheara, a new girl super hero with cochlear implants . In the past, the superhero “Hawkeye” had hearing loss and wore a hearing aid. Feeling useful and needed makes children feel important and builds confidence. Jobs should be age-appropriate. Be specific about what is expected. Say, “Please put a napkin on each plate,” not “Help me set the table.” Even two-year-olds can learn expected to mommy or daddy for help if their hearing aids/cochlear implants are not working. They can also learn – by age 3! – to be responsible to put on their own hearing aids. Showing your child that you recognize how he is growing and learning helps to build his confidence. Hooray! You heard that! 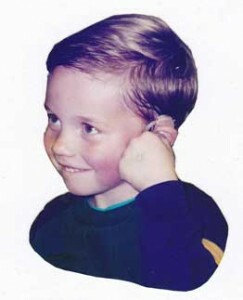 What a big boy – you are learning to put on your own hearing aids! What a big girl for telling mommy your hearing aid was not working! Encourage your child to try to master tasks he is struggling with. Children learn by doing. Break down difficult tasks into small steps to help him feel in control, confident, and safe. As you work on a task or skill that is tough for your child let him know you believe in him, but also communicate that you will not be disappointed if he isn’t yet ready. You are there to support him whenever he is ready to try again. Learning how to put on hearing aids takes much patience and praise! Provide language that accurately reflects his experience, shows understanding and empathy, and instills confidence. Be a role model yourself. Children are always keenly watching their parents for clues about what to do or how to feel about different tasks or social interactions. When it comes to learning how to manage emotions like hurt, anger, or frustration, you are their “go-to” person. If you can model persistence and confidence in yourself, your child will learn this too. Try new things and praise yourself aloud. “I was really frustrated putting up that shelf. It was hard to do. When it fell, I was mad. I rested and tried again. Now I’m proud of myself for getting the job done and not giving up.” For a HANDOUT of this page, go to Helping Your Child Build Self-Confidence This information was excerpted from the excellent information available at ZERO TO THREE https://main.zerotothree.org/site/PageServer?pagename=ter_key_social_confidence&AddInterest=1157 Information included on https://successforkidswithhearingloss.com/self-confidence Supporting Success for Children with Hearing Loss; May, 2013.